It’s certain to jump-start some interesting conversations as your group members thinks back to their glorious, or maybe not so glorious, high school days. Your group is bound to learn something new about each other as you work the room searching for a match! I would have never guessed Susan was a cheerleader in high school! Can you believe Donna played the tuba?! Did you catch Tamara’s hysterical cafeteria story? Be forewarned – your group may end up begging for time to share a few high school stories! Instructions are also included on page 2 of the free PDF download. Just click the link in the supply list below. 1. 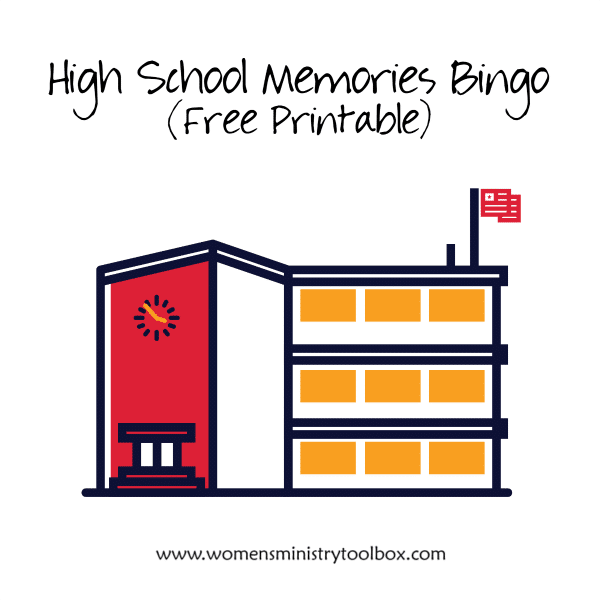 Print off one High School Memories Bingo card per person. 2. Give the group instructions. Today/tonight we’re going to take a walk down memory lane – all the way back to your glorious (or not so glorious) high school years. Who remembers what their school mascot was? Who loved English? Who married their high school sweetheart? You’re going to find out the answers to those questions and more as we play our game tonight. Your task for the next several minutes is to search the room for women who match the situations listed on your bingo card. When you find a match, ask them to put their signature in that box. Search carefully though, as you can only have each woman sign ONE box. And search quickly as the first one to fill the entire card wins a prize. Let us know your card is full by shouting “Bingo!” Grab your pens and you may start NOW! 3. End with one of these optional wrap-up ideas. 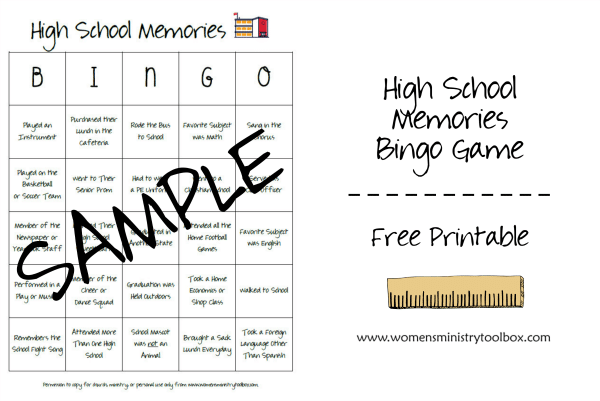 Read through the items and activities listed on each square and have the women stand if it describes them OR see who can remember and sing their high school fight song. Consider giving a cute notebook with a scripture verse (affiliate link) on it or another “school-themed” prize to the winner. I hope you group enjoys the game! I’d love to hear from you if you use it! I was tasked with planning the games for the ladies retreat this year, 4 games for 30 people. I am excited to do it but also felt concerned that these need to be fun or else I’m responsible. I am so glad I found your website! Thank you, thank you, thank you! Liz you could have them just try to fill 5 in a row. You’re right, your group may not be able to fill the whole card. So the high school ice-breaker is generic and just hope there is a fit to fill out the whole card?